June 20, 2018 Amy P.
A few months ago, I sorted through my books and made two sections: read and unread. I included all the books I've abandoned mid-way in the unread pile and then shelved them all accordingly. Since then, I've been pulling off my unread list before I'm allowed to purchase any new books (other than downloading Audible books). 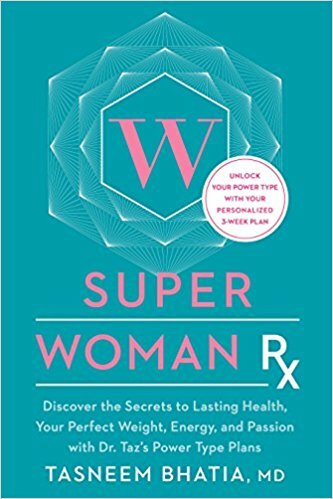 I'm not even sure how I came to own a copy of Super Woman RX: Discover the Secrets to Lasting Health, Your Perfect Weight, Energy and Passion with Dr. Taz's Power Type Plans. It was just released last year, so I must have purchased it after our move. Seriously, I don't even remember doing that. Alas, it was there on my shelf, so I thought: I could use some tips for lasting health, more energy and some good ol' passion. I read the book in less than a day, for three reasons. 1. The book is written in a way that is easily digestible, with a lot of lists and boxes with bits of information. 2. Much of the information Dr. Taz provides is pretty common knowledge for anyone who's studied alternative healing/medicine or explored non-Western health concepts. She explains Traditional Chinese Medicine (TCM) and Ayurvedic medicine, both of which I'm familiar, so I skimmed a lot of these sections. Also, the last section of the book explains exercises like yoga, so unless you're unfamiliar with yoga, that part of the book is easily skimmed. 3. Finally, Dr. Taz has a quiz you take (it's not a short quiz, either) and then assigns a 'power type' for you to read more about. This is great (more on that later), but that means that a good chunk of the book is about another 'power type,' so I didn't read everyone else's type and subsequent 3-week plan. In short, only about 1/3 to 1/2 of the book actually related to me or was useful. The fact that I read the book in one day and that a large portion of the book wasn't especially relevant to me doesn't mean that I didn't 'get anything' from reading the book or that I think it was a waste. In fact, I was impressed with a lot of what I read, even if I'd already heard it before, because I think Dr. Taz has a really broad understanding of health from multiple cultural perspectives. She uses a varied approach to health that I appreciate, having found that one-size-fits-all doesn't work when it comes to the health and longevity of each individual person. 1. 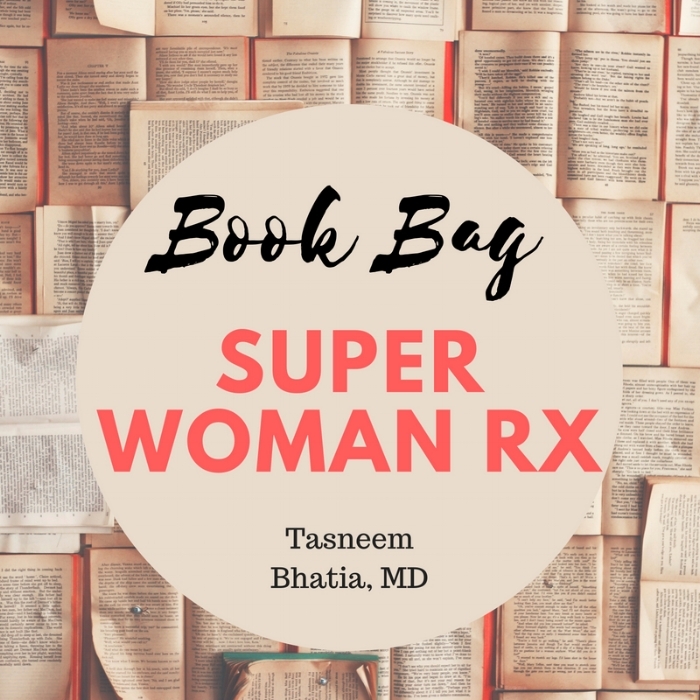 Dr. Taz starts by describing her hectic, busy, filled-to-the-gills morning and day, which she says should be stressful but isn't because she's found a way to harness all of her powerful energy and be a true super woman - something like that. When I read her description of everything she does in a day, I felt exhausted. It's not a life I aspire to....at all. So, at first, I was put-off by the introduction and doing some major eye rolls. Just know that if you don't aspire to a chock-full life of busyness (even if that work is compelling), just keep reading. It gets better. 2. Dr. Taz gets pretty specific in the first section of the book while describing some of the health/wellness issues women face and how to address them. She gives lists of vitamins and supplements she recommends, with actual dosages, and she lists actual lab work she suggests having done. I haven't seen this in a lot of wellness books. Even if I didn't take all of the suggestions, I liked having a concrete idea of what she's talking about. 4. At this point in the book I was feeling like I'd purchased an expensive Cosmopolitan magazine quiz. I was kind of annoyed with writing all that stuff down and tallying up my numbers. I thought: is this a waste of time? Readers....I don't like being called a chick of any sort and savvy isn't exactly the first word I'd use to describe myself. More eye rolls. 6. Then, just when I was ready to give up on this book as another padded wellness book to promote a celebrity doctor, I read my power type. I was looking for generic descriptions of any modern woman with equally generic suggestions for how to achieve wellness like sleep more and light lavender candles. Um.....what I read sort of stopped all of my negative inner dialogue and made me sort of take notice? The artist in her wants to stay true to her visions and dreams and to follow the flow of creative energy, but the commander in her demands productivity, results, and structure. The Savvy Chick vacillates between creativity and inspiration and ordered schedules and tangible outcomes, all while insisting on adherence to her busy regimen - which can add up to burnout, blowups and exhaustion. I read that to my sister, who sat (on FaceTime) with her mouth open. She said, "Oh wow...she nailed you." I then read my sister her power type, and we both sort of sat with both of our mouths gaping. She nailed my sister, too. So....I kept on reading, taking this book and Dr. Taz a little bit more seriously. 7. After determining your power type, you'll then read about common conditions you may suffer from. (My list includes: anxiety, migraines, IBS/Constipation, infertility, TMJ, insomnia, eczema. I suffer from 5 of those exact conditions.) After the conditions, Dr. Taz gives you a three-week plan to address a lot of these conditions and balance your body and mind. She has an At A Glance guide of 10 steps and then goes into further detail for the remainder of the chapter, addressing vitamins/supplements, diet, exercise and mindfulness. 8. Each power type has a kryptonite (her words) and for mine it's 'the multitasking electronics world.' She hit the nail on the head there, too. I know some people who can be online all day and not feel much worse for it. It literally saps my energy. I have to be very careful about phone use, laptops use and other electronics. I need a lot of down time, and I realize now that other people may not feel the same. Shocking, I know. 9. Dr. Taz recommends a workout schedule and other tips for balancing your power type, and one of the suggestions was that my type not begin the day with any technology at all. Instead of reaching for my phone, I should get up, drink water and do a 'grounding' exercise like yoga. Um....get up and immediately begin exercise? I normally get up and immediately begin coffee. But, since she'd been on-point with my whole power type, I decided to at least try it. Readers....I have stuck with this new habit every day for over a month. And y'all know how I don't always stick with new habits! I have noticed more stable energy throughout the entire day when I do yoga in the morning. I have missed three mornings, and each of those days I noticed a major energy drop in the afternoon. It is so noticeable, that I now won't leave my bathroom before doing a short yoga routine on my mat, right there in front of my sink. Even my husband is impressed (and little impresses that man). I look for habits that make a noticeable, quantifiable difference in my life. Doing a short yoga series before I begin my day has made just that. 10. Finally, this isn't the best book I've ever read, and I think it could have been significantly shorter and better. It is a mass-appeal book, though, and I get that. Many of the suggestions are common sense. A lot of it you've all heard before, and for that reason, it's not earth-shattering. But....my whole goal when reading a book like this is to get one thing, one tip, one little bit that might make my day-to-day just a tiny bit better. This book delivered several of those bits, the morning yoga chief among them. Having said that, I didn't read the other power types, so it's possible they're all a version of the same thing. In short (hahaha), I'd recommend this book if you're feeling rundown, overwhelmed or generally like you want to jazz it up or calm it down (I want both). While much of the book may not apply to you specifically (and you may not take all the suggestions), what does apply is pretty on-point. Verdict: 3.5 out of 5. That might be my longest book review to date? My day is chock-full, so I'm off to hustle.